Nope, none yet. Still have a few years to go for that. Synopsis: The politician John Joseph Bonforte has been kidnapped on an important trip to Mars, and the two-bit actor The Great Lorenzo, who looks nearly identical, is corralled into posing for him until he can be rescued. It’s a pretty interesting take on the Prince and the Pauper story archetype. Verdict: Yes, this one definitely deserves it. The Great Lorenzo, A.K.A. 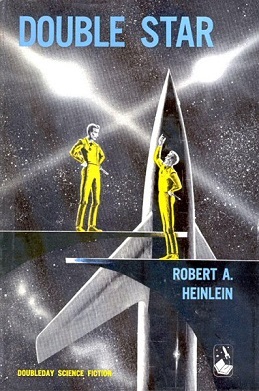 Lawrence Smith, is one of the most flawed and interesting of Heinlein’s protagonists. The book does, however, fail the Bechdel Test- the only female character, though she is strong and capable, is largely in there to be a romantic interest. To be fair, I think we’ve only had two books so far that pass, The Mule and (I think) the Demolished Man. Anyhap, really short book, definitely recommend it. I initially had a lot of complaints (How is someone supposed to mimic someone else with technology that advanced, fingerprints or DNA testing (which, admittedly, weren’t really a thing when this was written) would have given up the game?) but they’re largely answered well later on. (Bonforte and Smith’s medical records get switched). Trivia: Well, this happened in 2000. Weird.